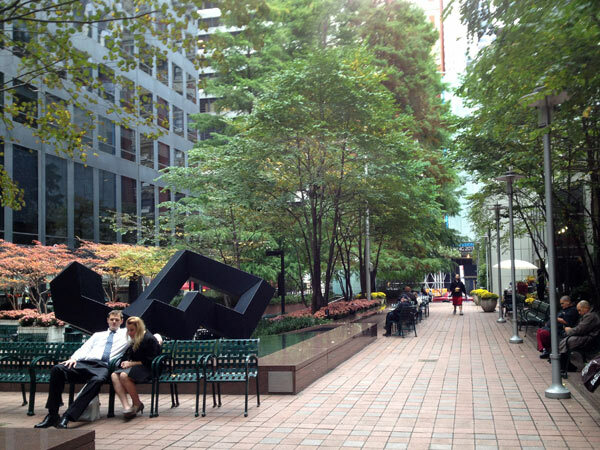 This half-acre, public plaza between West 45th and 46th streets in Midtown Manhattan is located behind the Modernist tower designed by Skidmore, Owings & Merrill in 1974 for the International Paper Company. 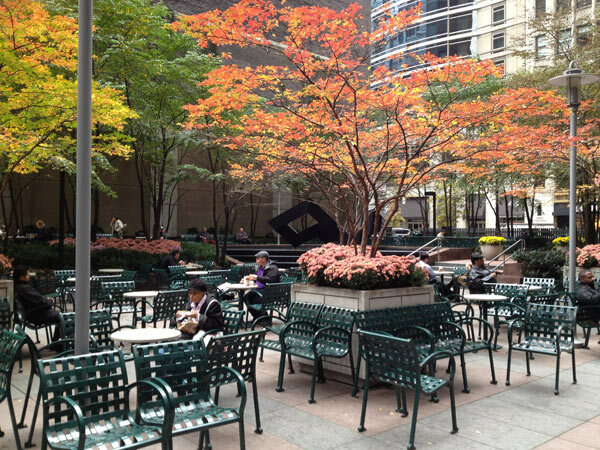 The plaza was redesigned in 1983 by Masao Kinoshita, Tom Wirth, and Gerry Venable of Sasaki Associates. 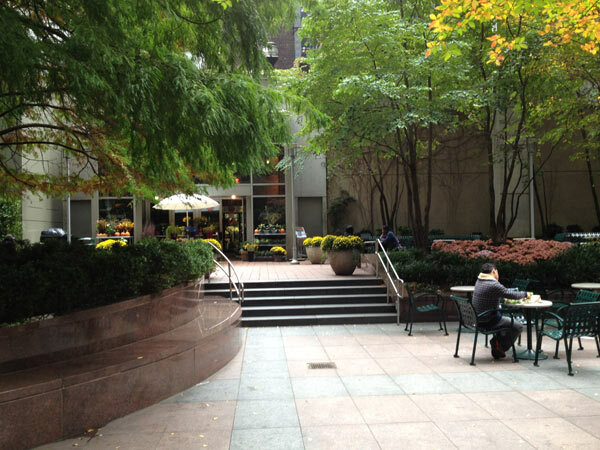 Situated on the building’s east façade, the plaza features an arcade, a central garden area, and a peripheral walk. 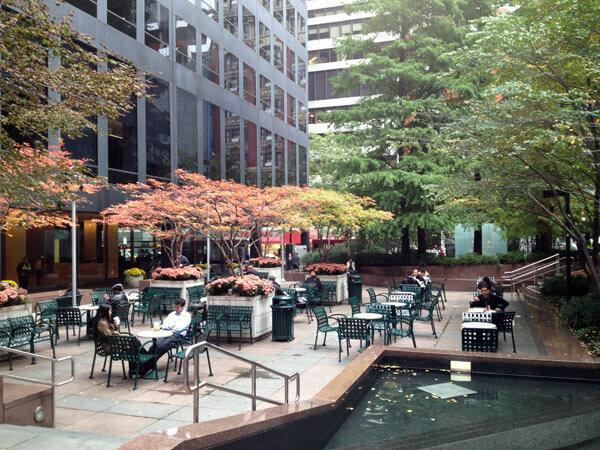 The geometrically-arranged garden space included a tree-shaded café, a large central fountain, and a dense grove of dawn redwood, white fir, weeping cherry and dogwood trees. 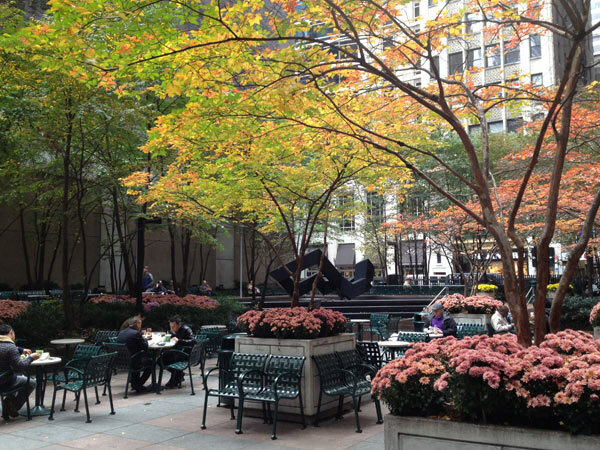 Circular planters and rectangular planting beds held flowering shrubs, while Japanese pagoda trees and scarlet oaks screened the vest-pocket park from the street. 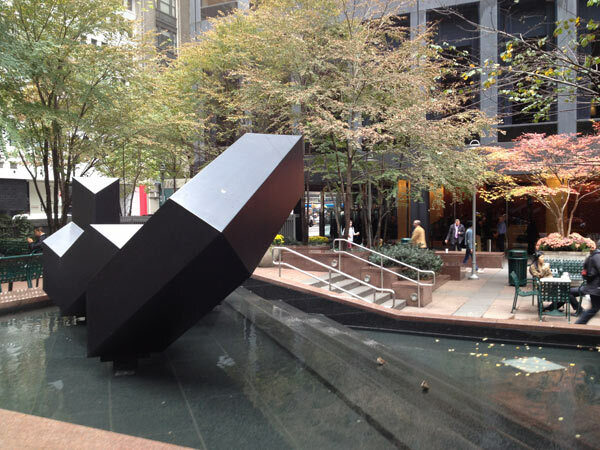 A water channel meandered from the fountain (anchored by Tony Smith’s sculpture, Throwback), through the arcade to a tiered pool on the west side of the grove. The design also included brick pavers as a unifying element, Corten steel gates, brick perimeter walls, seat walls and lighting for nighttime use. 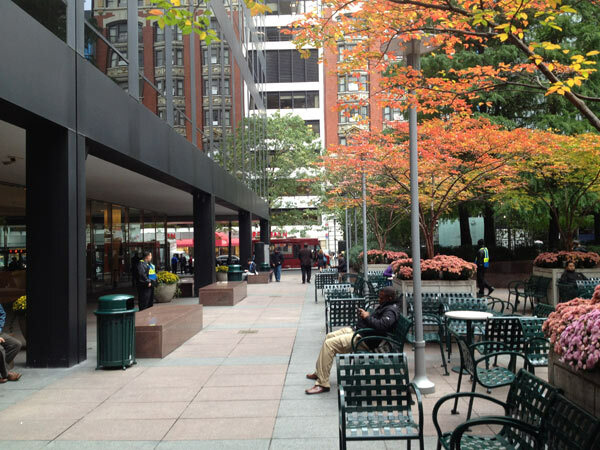 After 2002, building owners Marsh & McLennan Companies hired Hoffman Architects to redesign the plaza. Polished pink granite walls replaced the fountain’s low brick walls, and the channel and stepped pool were removed. A larger pavement module replaced brick paving, while square concrete planters replaced circular wooden ones. Fixed, pink granite seating and movable chairs were also added. A stone edged, glass wall of names memorializing Marsh & McLennan employees killed on September 11th, 2001, is now a focal element at the north end of the plaza.